Summer this year was divided between two countries - India and U.S.. While travelling and visiting the fam in India, you hardly get time to document your outfits. But still, I was able to coax my family members (especially my dad) who sweetly obliged to take outfit pictures for the blog. I did a separate post about my outfits during the India trip. 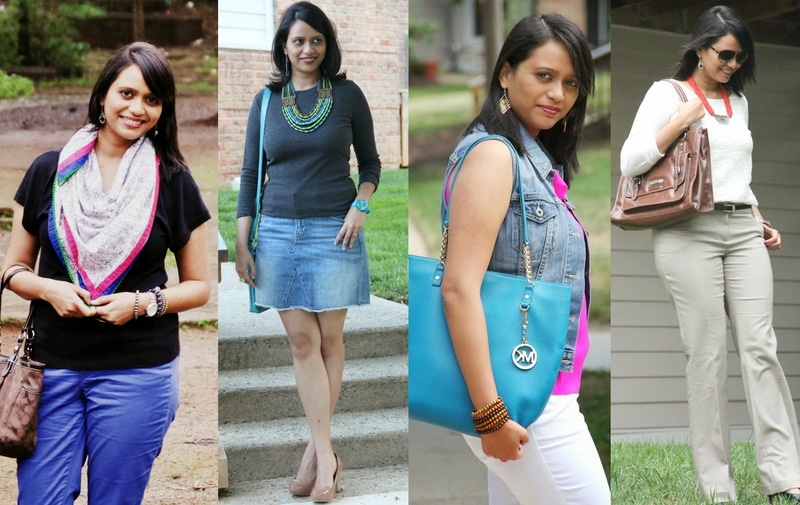 But between all the frenzy, I was able to do an outfit photo-shoot in India thanks to a dear blogger friend - Shubhi from Fairytale Style. It was so much fun shooting with a blogger; a lot different than the shoots with my husband but nonetheless it was super fun and absolutely memorable with the rain and what-not! 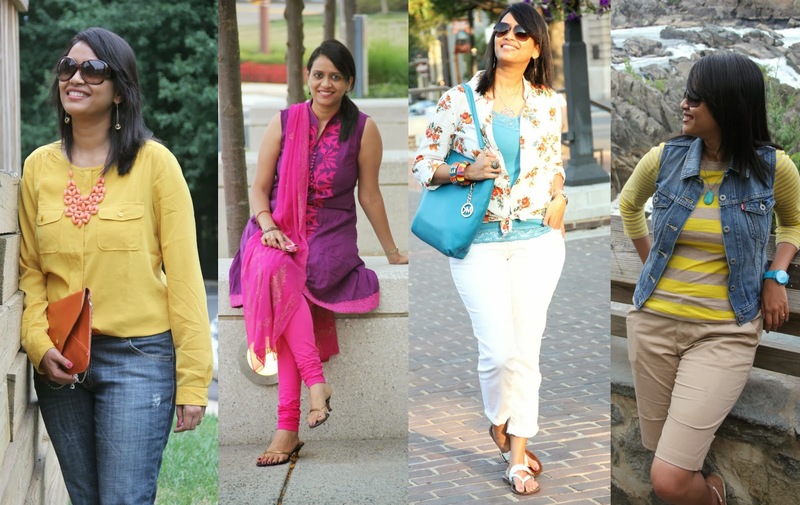 Dressing up for summer, in the US, was filled with colors and of course white. I added white pants to my summer wardrobe this year and (like an excited kid) flaunted them this summer, one two many times. There's an Indian outfit there too, in the summer edition, which added to my colorful-summer stint. So what's your fave summer outfit, mine is the Floral-shirt-and-White-pants one! Links to the individual posts are added below, as usual. Enjoy! And, And! The New Year countdown is on! I am planing to wear a blingy outfit for a soiree with a group of friends. What are your plans? Well, I wish you all a safe and happy NYE celebrations and a very Happy New Year!! Here's to Twenty-Fourteen! P.S. : Also if you notcied, I had a sleek new hairstyle now, thanks to my new hair-straightening experiment at the Lakme Salon. I think it was one my best style-moments of the year! Dunno why I was so wary of getting it done. I highly recommend it to someone who struggles with big voluminous, frizzy and wavy hair. Happy new year Ashwini. may this year bring you all happiness. I like the floral shirt outfit too but my favorite ones gotta to be the citrus colors one! Have you visited the new and improved website yet..
You look gorgeous in almost every look. Regarding hair straightening, I must say that I am very afraid to get a permanent straightening done for the fear of damaging and fraying my hair. But I am addicted to straightening my hair at home whenever I go out. My hair just doesn't behave otherwise. I think I am doing more damage that way. But I just don't know what else to do.